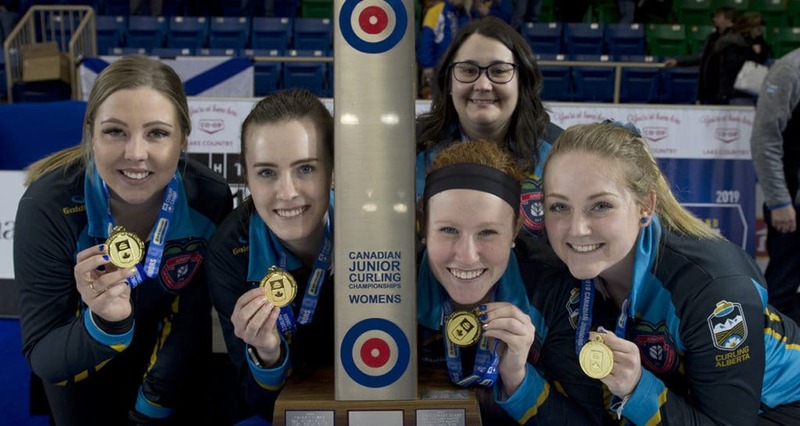 A run of steals in the third through fifth ends guided the victory for Sturmay, vice-skip Abby Marks, second Kate Goodhelpsen, lead Paige Papley and coach Amanda-Dawn St. Laurent from the Saville Community Sports Centre in Edmonton. Sturmay, along with Papley, are provided with a rare opportunity to represent Canada twice in the same season. They’ll play second and alternate respectively on Kristin Streifel’s Canadian team at the Winter Universiade Games in Krasnoyarsk, Russia from March 2-12. Sturmay’s brother, Karsten, will also represent Canada as skip at the competition. With the teams tied 1-1, Alberta took advantage of a missed hit by B.C. to steal one in the third end, followed by steals of two in the fourth and one in the fifth for a 5-1 lead at the halfway point of the game. But Alberta’s lead wasn’t safe. Daniels, vice-skip Kayla MacMillan, second Jessica Humphries, lead Sarah Loken and coach Katie Witt from the Delta Thistle Curling Club in North Delta mounted a solid comeback attempt by scoring a deuce in the sixth, forcing Alberta to one in the seventh and tacking on three more in the eighth to tie the game 6-6. However, Alberta put the game out of reach with a score of three in the ninth for a 9-6 lead and ran B.C. out of rocks in the final frame. Alberta is the first women’s team to win the New Holland Canadian Juniors with an undefeated record since Rachel Homan of Ontario did so in 2010. Only six teams had previously ran the table at the national junior women’s championship since the inaugural event in 1971. In addition to Homan, those undefeated teams are: Cathy Overton of Manitoba (1989), Cathy King of Alberta (1978), Patricia Crimp of Saskatchewan (1975), Janet Crimp of Saskatchewan (1973) and Chris Pidzarko of Manitoba (1972). “It definitely feels surreal right now. It definitely hasn’t kicked in that we’re Team Canada but I’m sure it will within the next couple of days. I’m just over the moon happy right now,” said Sturmay. Team Sturmay will wear the Maple Leaf for Canada at the 2019 World Junior Curling Championships this Feb. 16-23 in Liverpool, N.S. Alberta second Goodhelpsen is representing Canada for at the world juniors for the second time in her career. She won the national junior title as second for Alberta’s Streifel in 2017 and won bronze at the world championship in Pyeongchang, South Korea. The team also represents the University of Alberta Golden Pandas and will attempt to qualify for the 2019 U Sports/Curling Canada University Championships in Fredericton, N.B. this March 15-19. The 2019 New Holland Canadian Junior Curling Championships conclude today with the men’s gold-medal game between two-time defending and reigning world junior men’s champion Tyler Tardi of British Columbia (Langley and Victoria Curling Clubs) and Manitoba’s JT Ryan of the Assiniboine Memorial Curling Club in Winnipeg at 3 p.m. (Central). 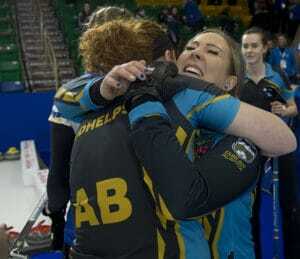 TSN/RDS2, the official broadcaster of Curling Canada’s Season of Champions, will provide live and exclusive coverage of the womenʼs and menʼs finals on Sunday, Jan. 27. The same games also will be streamed live in the U.S. on ESPN3. CLICK HERE for streaming and broadcast information.